Made on special request for the HFT and UK shooters. 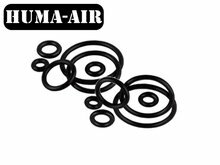 Huma Air in close cooperation with Airborne Arms NZ, developed this tune kit for the Edgun Leshiy to convert your rifle into a 12 ft/lbs (16 Joule) HFT version with an enormous shotcount. 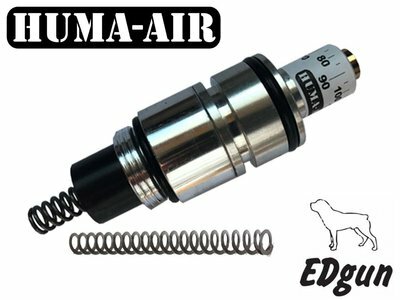 Our kit contains our micro regulator, a special plenum with a matching valve return spring, a power sleeve and a new softer hammerspring. If you want to do some more tuning; the regulator has a clear pressure scale so you can easy adjust it to your wishes. 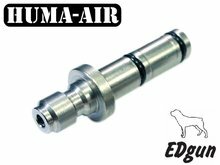 These regulators are also vented to the atmosphere without any modification to your pressure tube needed so no creeping up in power. His instructions video will give a good indication of the setup, to tune and adjust your rifle to the best performance you do need some skills in adjusting your hammerspring tension and regulator pressure combination. Beside the Gen1-Gen2 differences, there are also some different strengths/types of hammersprings used in some leshiy rifles. These rifles might need some different setup and can give another performance. Please check the tab "Reviews" of this regulator were we share the user feedback and their setup used. Per 1-2018 we include an new softer hammerpring to the set. Excellent quality product. It took some experiments and lots of hand pumping to figure out the most optimal configuration. With a .177 caliber 250mm barrel, I get about 60 shots from 250 bars down to 80 bars, 11 FPE each shot. Reg. is set to 85 bars and the delrin insert is left out. At least with a .177 barrel, increasing reg. pressure to 120 bars and putting the delrin insert in did not improve shot count from 200 bars to 150 bars compared to 85 bars and no insert. A .22 gun is probably a bit more efficient due to the increased cross section area and utilize the higher pressure better. More shots, tighter strings, excellent support with installation which was very easy. Delrin insert offers greater tuning flexibility depending on personal preferences. A shortened valve stem would be a good addition to the kit though as this would allow you to keep the original in tact if ever required. Even if it increases the cost slightly. Really pleased. Very well made regulator, easy to install. Getting 90 shots from a 250 bar fill, regulator set at 100 bar in my .22 Leshiy. Fantastic consistency. I do think that the reduced plenum should be one piece though, negating the need for the delrin insert. I received my sub 12 reg sooner than I expected .. it took me a few days to gain the courage to install it as I had to cut down the valve stem.. it would have been great and stress free if a shortened machine cut valve stem would come with the kit.. that would be my only gripe.. I still have some more testing to do but I’m very happy I made the choice to install it already.. way more number of shots that I ever expected from this little goblin and consistency on par with the original.. ave spread 10fps..
All round Def a happy customer.. I bought this tuning kit prior to the delivery of my Edgun Leshiy which arrived last Wednesday. 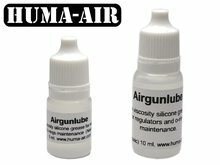 I had ordered a 12ftlb version as I live in France whose power limit is 20 joules and to stay legal I could only buy a sub 20 joules air rifle. Prior to purchase I watched the installation video several times and assessed that the modifaation to the valve was within my capabilities and in my comfort zone. The kit arrived very quickly and it waited until the Leshiy was delivered. I did the first chrono runs as it was delivered and it had been very conservatively but never the less legaly set to sub 11 ftlbs. Hi i have a Gen2 Leshiy ,serial number 057X .20 cal 250mm short barrel. My sufficient needs require no more than about 11ft/lbs / 600fps , so that was the aim for my tune. after lots of testing i have got it just right. Using the new Huma sub12 hft regulator kit, i have the regulator set at 82bar and my hst is 12clicks from lowest. I am extremely happy with these results! 85 shots for such a small rifle with small cylinder Amazing! I have a Gen2 Leshiy, serial number 062X. 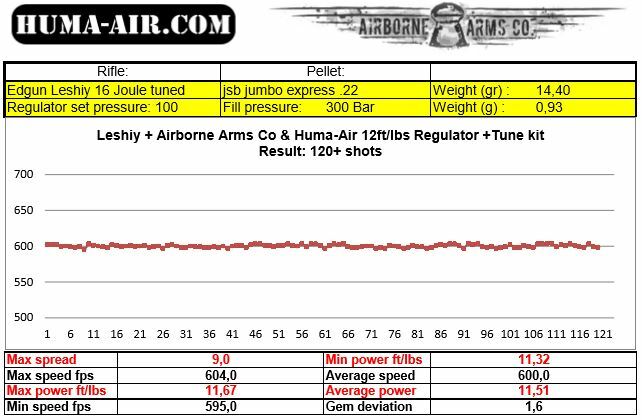 I have tested the regulator with three barrels between 90 bar and 120 bar and have found 105 bar reg setting to be best on mine. The short .22 barrel gave me +100 consistent shots using 18.1gr JSB 5.52. The short .177 barrel gave me +80 consistent shots using 8.4gr JSB 4.51. The long .177 barrel gave me +90 consistent shots using 8.4gr JSB 4.51. I kept the power around 11.5 ft/lb via the hammer spring adjuster, which was normally 2 or three clicks either way depending on which barrel I used. 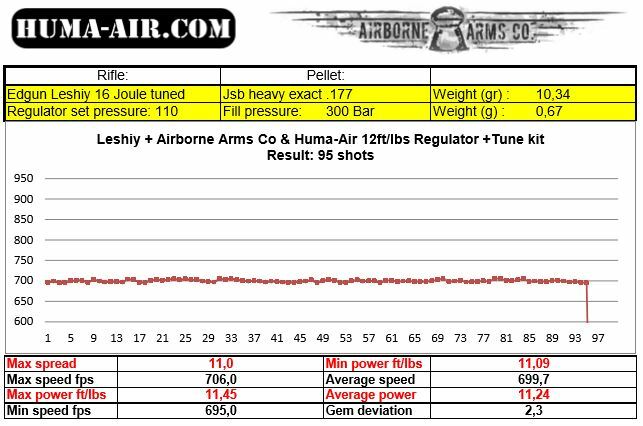 With the regulator set at 120 bar the power did creep just over 12 ft/lb after it fell off the reg with all of the barrels but it is fine set at 105 bar. Double the shot count and very little deviation compared to the original regulator.